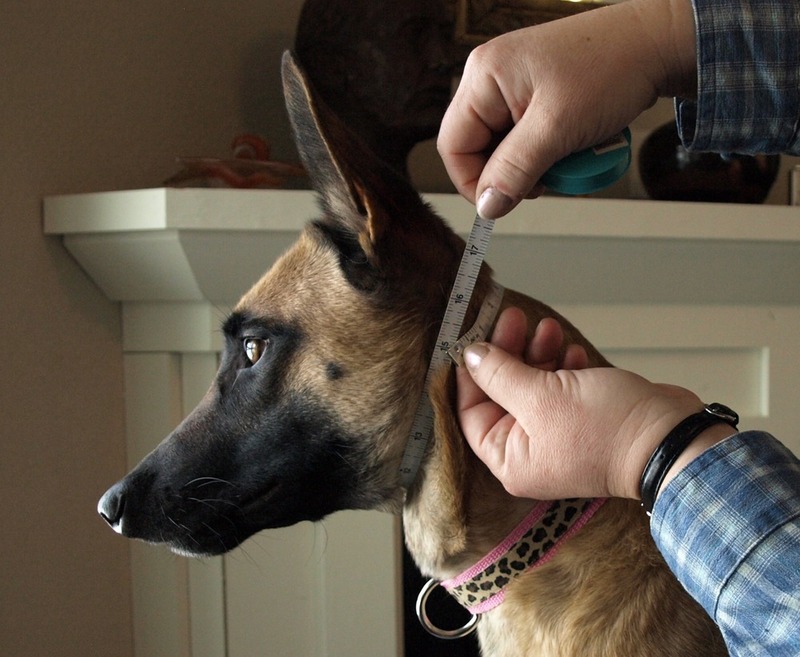 Here's Kit, the Belgian malinois, being measured. Measure just under the jaw and behind the ears. The measurement should be snug, not tight. When we build the collar, we will add the necessary slack into the collar so don't worry about it being too small. As you can see, Kit measures 15 inches. 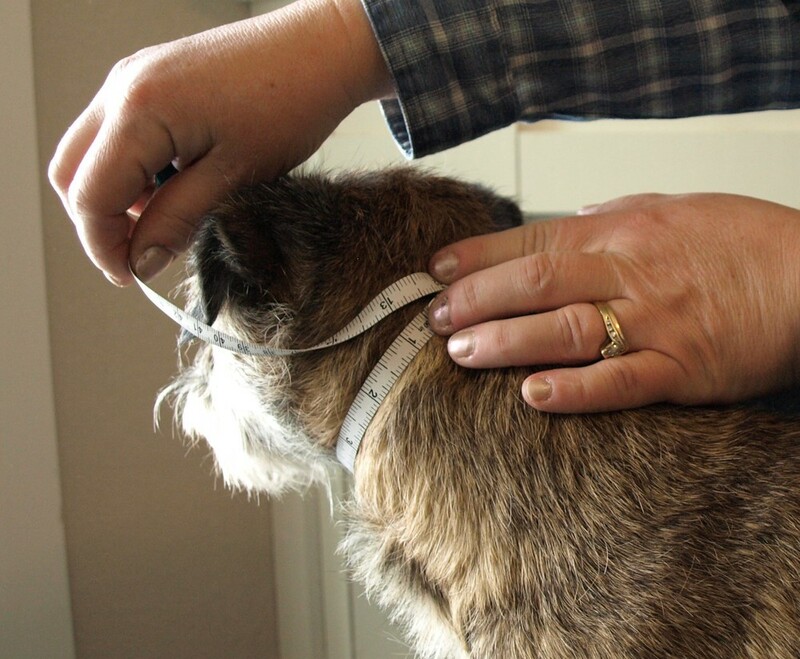 Here's Maggie, the border terrier, being measured. She comes in at 12 inches. All of our prong collars come standard with Medium sized prongs. Large prongs are available as an added cost option on our Options Page. Below are some photos showing the different prong sizes. The large prong is on the left, medium is in the middle and the micro-prong is on the right. The Medium prong is the 'go-to' size for almost every collar. A collar with Medium prongs provides the best fit in most cases and the combination of wire diameter and number of prongs results in the most contact area for a given collar size. Medium prongs are standard on all of our Keeper Collars Hidden Prong Collars. Large prongs have their place. They can work well for a large breeds with a heavy, THICK coat, such as an Old English sheepdog. Large prongs are an added cost option to a Keeper Collars Hidden Prong collar. Micro prongs can allow small collars to flex more easily around a smaller dog's neck. However micro prongs are the most severe of the prong sizes due to the smaller wire diameter of the prong. We recommend micro prongs only for dogs under 20-25 pounds and many of those dogs can get along very well with Medium prongs. If you want a collar with micro-prongs, please call us. Due to the cost of micro-prongs and the number of micro-prongs needed for a collar, there is an increased cost. If you have any questions about prong sizes please feel free to contact us. Many people want to know how visible the prongs will be on a certain collar design and size. These photos should help to explain. Please remember the size of the collars are based on the web only, that is not the width of the over all collar after leather , the leather will add to the width and that my very on the leather you choose. Here are the same three collars with the prongs down. You can see that the collars do appear to stand up a bit due to the prongs. This is more noticeable with the narrower 3/4 inch and 1 inch collars. All of the collar sizes have their place in training, it's just that the prongs will be more visible with a narrower collar. If you go with a double leather lined collar, there will be a bit less of the prongs showing because all double leather collars are about 3/8 inch wider than a single leather lined collar, shown here. Any collar of a given size WITHOUT leather lining will show more of the prongs simply because the collar will be narrower than an equivalent leather lined collar. An unlined collar will also show wear more readily than a leather lined collar. There are other advantages to a leather lined collar. We are the only people who offer a hidden prong collar with this soft leather lining.